Hundreds gathered at the University of Toronto's Athletic Centre on Saturday for a major powwow, featuring traditional dancers, food and Indigenous culture. The event, organized by the university's Indigenous Studies Student Union, was the first powwow at U of T in 20 years. It drew young and old from across the province, including Carolyn Bennett, the federal Minister of Indigenous and Northern Affairs and a U of T alumna. Bennett spoke briefly at the event and presented the Indigenous Studies Student Union with a painting of a wolf. The powwow officially began with the Grand Entry at 1 p.m., featuring prominent members of U of T’s community, including Susan McCahan, vice provost, innovations in undergraduate education, Indigenous faculty, and provincial and federal dignitaries. They were part of a procession into the gymnasium, some bearing flags. U of T Elder Andrew Wesley carried a flag for U of T’s First Nations House, where he is an Elder-in-Residence. Chief Stacey Laforme of the Mississaugas of the New Credit First Nation carried his community’s Eagle Staff and flags, signifying that U of T operates on land that is part of the Dish with One Spoon Treaty. Jennifer Sylvester, Indigenous Studies Student Union president and Indigenous Festival Committee chair, welcomed everyone to the powwow. The students union had been planning the event for a year. McCahan spoke about the university's response to the federal Truth and Reconciliation Commission's Final Report, saying that the university is committed to working towards reconciliation. McCahan also spoke about the university's commitment to funding more Indigenous faculty and staff. 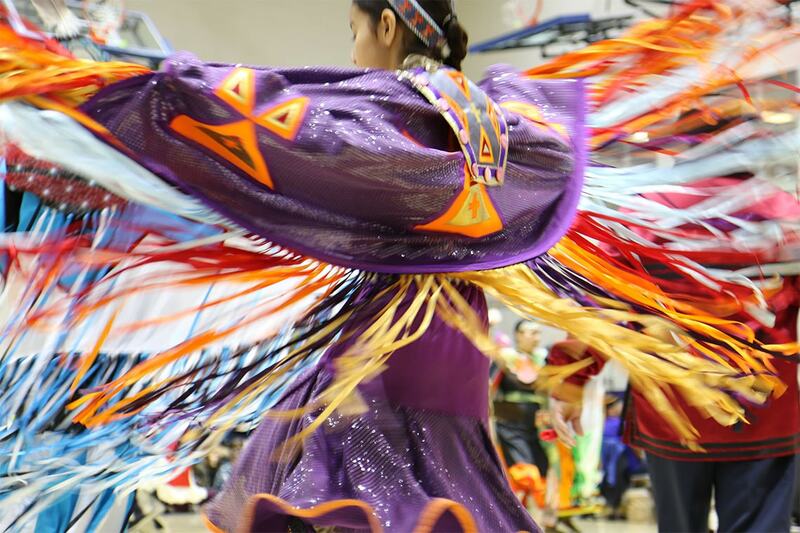 Dancers who performed at the powwow included hoop dancers, jingle dancers and Aztec dancers, many of whom are students at U of T.
The Athletic Centre gymnasium was transformed by dancers in colourful regalia, and the sounds of drumming and singing. Dancers of various styles – from fancy shawl to jingle to hoop dancers and Métis jiggers – performed throughout the afternoon. The powwow featured worskhops to teach guests how to dance in different styles, including a round dance and Métis jigging. Moyen noted that children played a big part in the powwow. “It was wonderful watching the children share in that sacred circle – children from all backgrounds, uniting and dancing, laughing and bonding as allies to the beat of our Indigenous drums and songs,” she said. People attending the powwow could browse tables full of handicrafts, and purchase bead work, leather goods and quilts. Missing and murdered Indigenous women were honoured during the powwow with a dance led by U of T undergrad Nichole Leveck, head female dancer at the event. Other dancers joined in, including Isadore Day, Ontario Regional Chief, in full regalia. The powwow celebrated indigeneity from around the world, including Aztec dancers. Master of Ceremonies Chris Pheasant said the Aztec dancers “brought the sun” with them to U of T.
Food vendors from popular Toronto eateries and catering companies including Nishdish Marketeria and Catering offering “First Nations cuisine” and Rick and Joanie's fresh squeezed lemonade were also at the event. The powwow concluded with a feast to honour all the special guests and students.